Super simple, super yummy dessert bars! 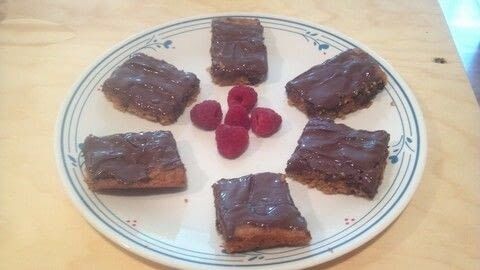 My inlaws where coming into town and I wanted to greet them with a yummy and simple treat. But what??? So I searched my kitchen to see what I had lying around and found cookie mix, nutella, brownie mix, peanut butter and coconut! I didnt wanna make just regular ol cookies and I had just finished making fudge brownie cupcakes with a peanut butter center so... Hmmmm....Well Bam! 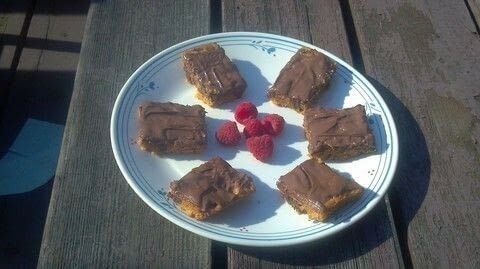 Cookie bars with a Nutella frosting! That's super simple and sounds divine and sure enough they were a huge hit! If you love sweet treats as much as I do then you will adore these! Mix softened butter, egg and cookie mix in a large bowl until all ingredients are mixed well and form a big cookie dough ball. 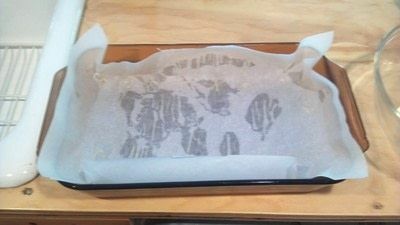 This makes it super easy to get the cookie bars out when they are done plus it leaves less dishes to do. 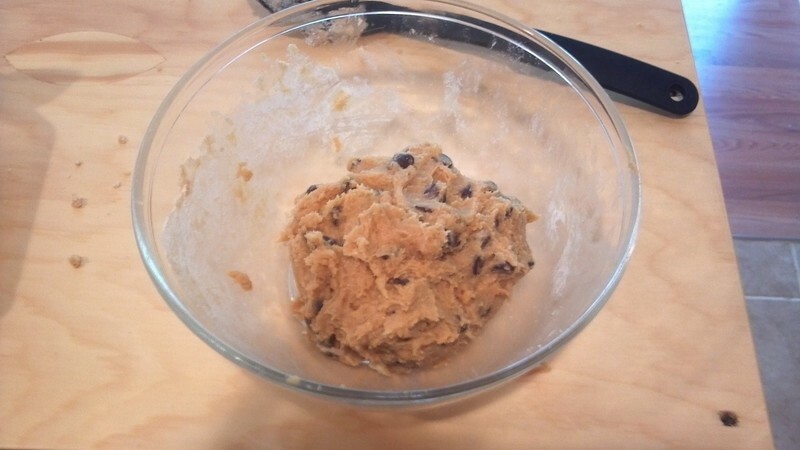 Take your giant cookie dough ball and place it in the middle of your pan. 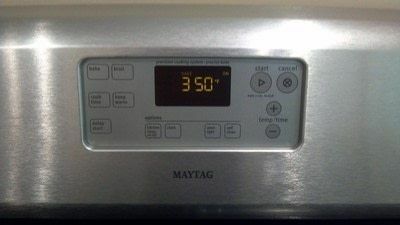 Then push down and spread the dough out evenly with your fingers so that it fills the entire pan. Put your cookies in the oven and cook for 35 minutes! 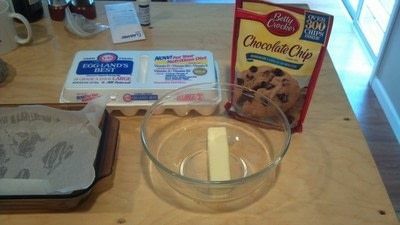 I find that if you use a tube or tub of ready made cookie dough like Pillsbury it only takes about 13-16 minutes to bake. 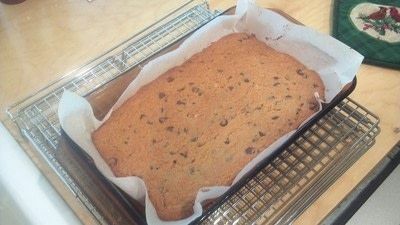 Basically if the cookies rise a little and look cooked and the edges are a tiny bit golden, they are ready! Now its not time to pig out yet! They must cool completely before removing them from the pan. Once everything is cool remove cookies from pan by simply lifting it out by the edges of the parchment paper and placing on your work space. Now its Nutella topping time! 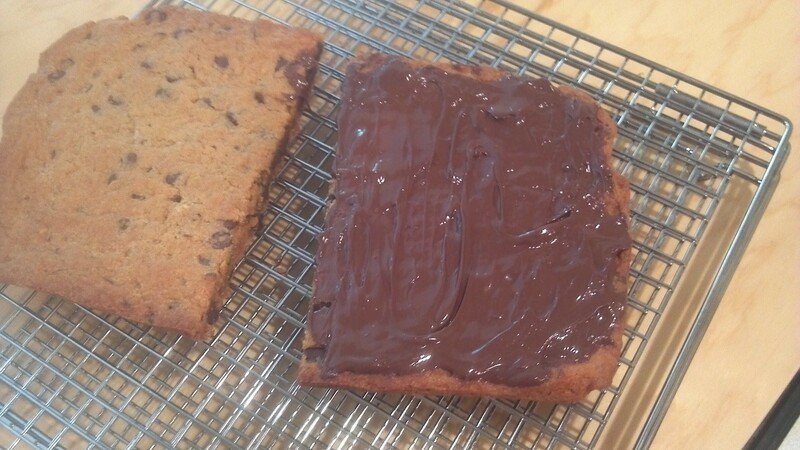 Take a butter knife or frosting spatula and spread a thin layer of the chocolate, hazelnut goodness evenly all over the top of your cookie bars. Smell, Taste, Marvel and Enjoy!! !